White feminism is a toxic cover used far too often by white women. But what is white feminism? White feminism isn’t when you’re white and a feminist. It’s “feminism” centered on white women. 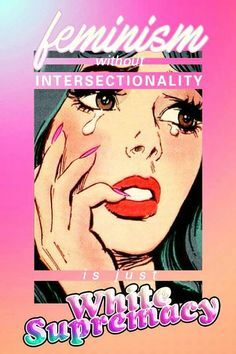 White feminism ignores the pain and struggle people of color face. A white feminist chooses to center their feminism on themselves instead of taking a step back and listening to people of color. White feminism has no action. A white feminist can be educated about the struggles of people of color, but without action, there’s nothing. It is not up to people of color to make these changes in society. It is up to white people. White privilege and white fragility is too common. Being white in America is a privilege. It’s not fair, and it’s up to white people to dismantle our inherently racist society. We as white people have to do better. When white people, often women, get called out for white feminism or simply not doing enough, white fragility too often kicks in. White people will get defensive, saying, “not me.” But when you do nothing, it is you. White silence is white complicitency. When brought into conversations about race, tone policing is a tactic white women often use against black women to escape conversations about race. Tone policing is getting defensive, and choosing not to listen to the person that is taking their own time to talk to you. It’s choosing to focus on the way someone is saying something instead of listening to what they’re actually saying. It is the choice to ignore someone. Saying a black woman should be “nicer” if they want to be listened to is absolutely ridiculous. Black women, and the black community have every right to be enraged with the way America is today. The system is built in favor of white people, and it’s wrong. I have seen white feminism far too often. Someone will call themselves a “feminist” but when it comes down to it, there is no action. It is also important for white people to educate other white people. It is not up to people of color to educate you about their suffering. Call your racist relatives out, and tell them why that’s not okay. Call your racist friends out. When you let other white people continue with racist behavior, you are just as bad. PAY THESE WOMEN. SEND MONEY TO THEIR ACCOUNTS, THEY DO THIS WORK FOR FREE.